« Be There TO Be Square! On my way out to a business trip in the Ukraine, I quickly looked up the weather conditions on Bing and did a quick search for ‘Ukraine Paragliding”. A 10-second analysis told me I should bring my paraglider on the off chance that I’d have some spare time after work and was able to find a good spot to fly. I am certainly glad I took the chance. 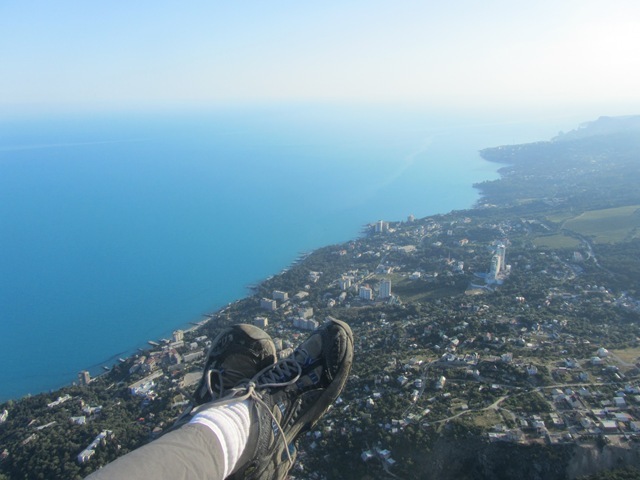 I had a great flight off the coast of the Black Sea near the town of Yalta in The Crimea, Ukraine. A bit more back story – I flew out to the Ukraine to meet with an equipment manufacturer. My key contact, Sergii, offered to make my hotel reservations since I have never been to the area. I left it in his capable hands and was quite happy with their decision. 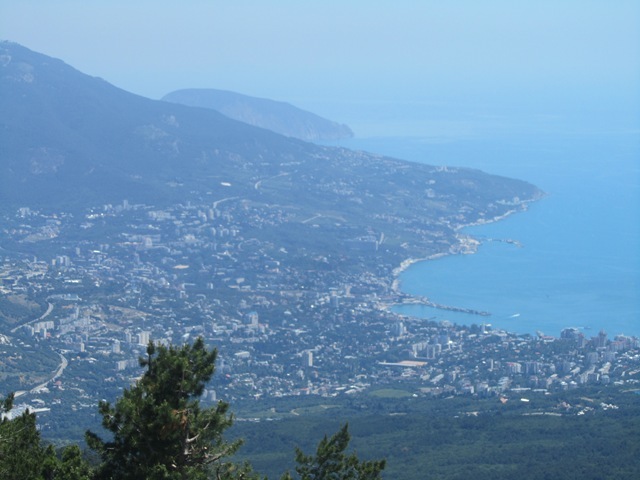 We stayed at the Oreanda Hotel in Yalta, a cool coastal town with a great boardwalk, rocky Black Sea beach, and a vibrant energy. The hotel is listed as “One of the Special Hotels in the World”. Anyway, after work they offered to take me to a local, world-famous winery, Massandra (more on that in another post). Sergii did some research for me and found a flyable mountain about an hour away from the hotel. The mountain is generally flyable only early in the morning or after 6pm, so we ate a meal after the winery and headed up the long, winding road in Igor’s BMW SUV to get to the top of Ay-Petrinskaya Yayla mountain. We arrived at the top of the mountain right at 6pm. The views from this location were breathtaking. 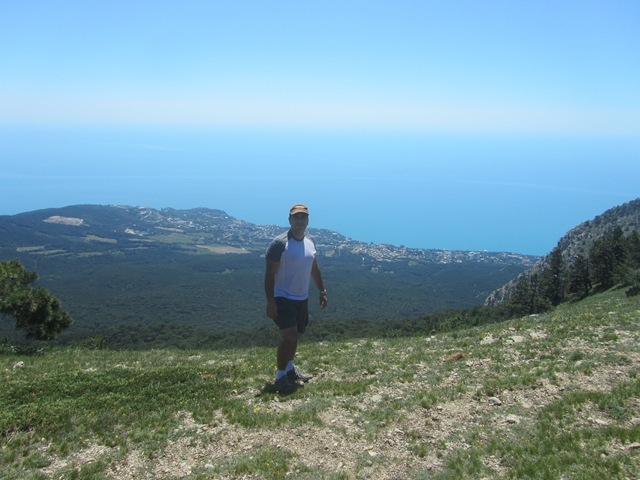 We were clearly able to see both the towns of Yalta to the East (the picture here on the left) and Haspra and Koreiz to the south. The Black Sea was an incredible deep blue, but unfortunately my photos don’t accurately portray that very well. The surrounding mountains were a combination of imposing cliff-faces and lush, green trees, which are clearly visible from any point in town. Once airborne, it was smooth sailing straight to the Black Sea. I circled over the town of Kurpaty for a bit, tempted to make a dash for the Sea and put down on the coast. I decided to err on the side of caution and headed back to the designated landing zone which was north of the main road. The road and landing zone are visible in the picture to the left. I decided to land as close to the road as possible near the center to minimize my travel over the dried vine-field to the exit. Total airtime was close to 30 minutes. I packed up my gear in my stuff sack and started hiking east on the main road to minimize Igor’s trip from the top of the mountain to the main road to pick me up. I walked about 2 kilometers before they made it down. Overall, a great flying experience, my only regret is that I didn’t have more time in the Ukraine for additional flights. If I ever go back, I plan to have my paraglider handy again. 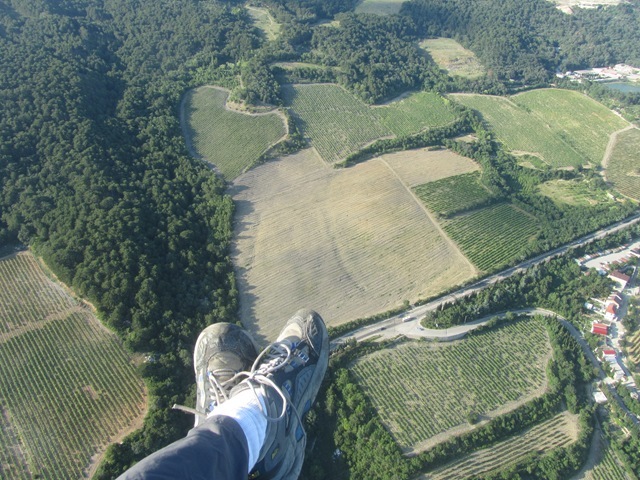 This entry was posted on June 10, 2012, 2:33 pm and is filed under Hobbies, Paragliding, Travel. You can follow any responses to this entry through RSS 2.0. You can leave a response, or trackback from your own site.